The Memorial Day weekend in the US guarantees a small group of domestic releases, but there are several discs I can strongly recommend, including Acid Mothers Temple & the Melting Paraiso U.F.O. 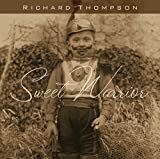 's Crystal Rainbow Pyramid Under the Stars, Cary Brothers' Who You Are, Je Suis France's Afrikan Majik, Moonbabies at the Ballroom, Piano Magic's Part Monster, Still Flyin's Za Cloud EP, and Richard Thompson's Sweet Warrior. I plan to pick up Juliana Hatfield's collaboration with Frank Smith, Sittin' in a Tree..., as well as the Merzbow disc, Coma Berenices. What new releases are you picking up this week, what can you recommend?